zplane(filt) plots the zeros and poles of the filter System object™, filt, with the unit circle for reference in the filter visualization tool (fvtool). Each zero is represented with a 'o' and each pole with a 'x' on the plot. Multiple zeros and poles are indicated by the multiplicity number shown to the upper right of the zero or pole. When you call the step method on the filter System object with a fixed-point input, the filter becomes a quantized fixed-point filter, filtQuant. When filtQuant is a quantized filter, zplane(filtQuant) plots the poles and zeros of the quantized and unquantized filters. The symbols and + represent the zeros and poles of the quantized filter filtQuant. The plot includes the unit circle for reference. 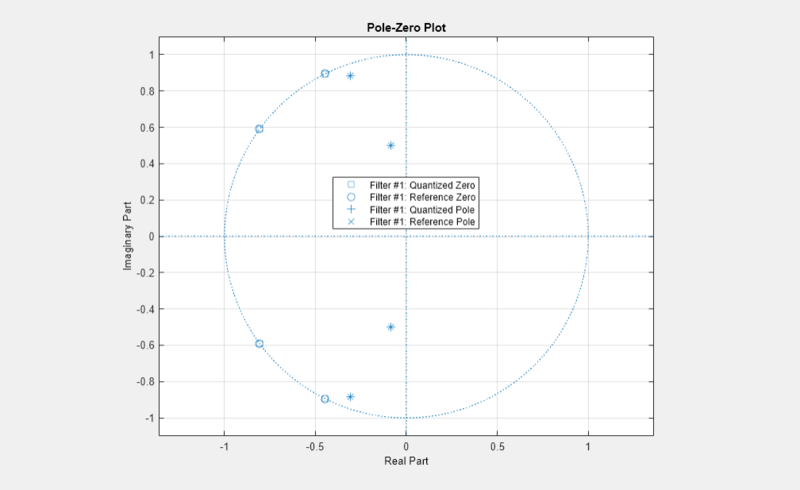 zplane(filt,Name,Value) returns the pole zero plot with additional options specified by one or more Name,Value pair arguments. [zLoc,pLoc,tLoc] = zplane(filt) returns the vector of locations for zeros, poles, and text objects. zLoc is the vector of locations of zeros, pLoc is the vector of locations of poles, and tLoc is the vector of locations of the axes/unit circle line and text objects which are present when there are multiple zeros or poles. In case there are no zeros or poles, zLoc or pLoc is set to the empty matrix . When you specify 'double' or 'single', the function performs double- or single-precision analysis. When you specify 'fixed' , the arithmetic changes depending on the setting of the CoefficientDataType property and whether the System object is locked or unlocked. Vector of locations of zeros. Vector of locations of poles. Vector of locations of axes/unit circle line and text objects. Create a Fourth-order IIR digital filter with a cutoff frequency of 0.6. Plot the poles and zeros of this filter. Quantize the filter by passing a fixed-point input through the filter algorithm. 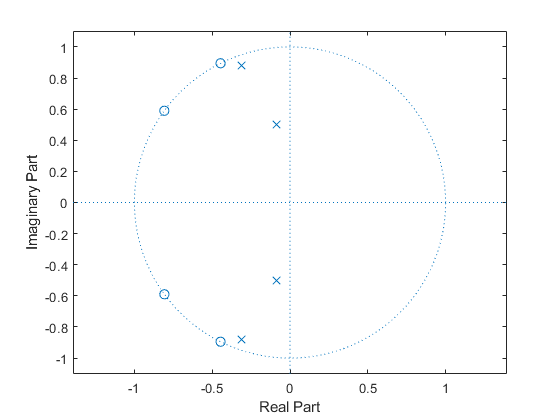 Plot the quantized and unquantized poles and zeros associated with this filter.